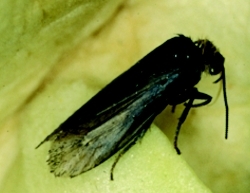 New findings show that co-evolution between Joshua tree and its pollinator moths, such as the Tegeticula synthetica shown here, acts to reduce diversity within the species, rather than increase it as was previously thought. Photo Credit: Christopher I. Smith/ Willamette Univ. Biologists have long thought that interactions between plants and pollinating insects hasten evolutionary changes and promote biological diversity. However, new findings show that some interactions between plants and pollinators are less likely to increase diversity than previously thought, and in some instances, reduce it. Findings, published in the Journal of Evolutionary Biology, show that local populations of one of the most distinctive plants in the Mojave Desert, the Joshua tree, are not as biologically diverse as would be expected. Joshua trees cannot produce seeds without specialized moths pollinating the tree's flowers. Previous research has shown that biological diversity exists among species of Joshua trees and their pollinating moths: Moths with longer ovipositors, the part of the moth used to lay eggs, favor trees with large flowers, while smaller moth species favor smaller flowers. Thus, biologists would expect the moths would adapt this trait to local flower populations and vice versa in order to reproduce. Yet using a combination of mathematical modeling and field studies, researchers observed little biological diversity among populations and thus no evidence that local populations of moths adapt to local populations of Joshua trees. "We had previously observed two species of moths and have shown that the larger moth species uses large flowers and the smaller moth species uses smaller flowers. However, once we account for this difference, there no evidence that moths have adapted to flowers," said William Godsoe, the study's lead author and postdoctoral researcher at the National Institute for Mathematical and Biological Synthesis. The observation is consistent with recent work from biologists at the University of Idaho who, using a mathematical model, determined that in some cases interactions in nature don't increase diversity but instead reduce it. In a study published in The American Naturalist, University of Idaho biologists Jeremy Yoder and Scott Nuismer developed a mathematical model to compare how different interactions in nature affect biological diversity. "The interactions we stimulated all change the evolution of the interacting species," said Yoder, who also co-authored the study on Joshua trees. "But different interactions can have very different effects – some increase diversity, some don't increase diversity at all, and some can even reduce diversity." The Joshua tree study is a collaboration of theory and field work. "The patterns we're finding in the Joshua tree and moth data are exactly what we expect from the theory. Coevolution between Joshua tree and its pollinators acts to reduce the variation within species, which creates stronger contrasts between moth species and Joshua tree varieties," Yoder explained.